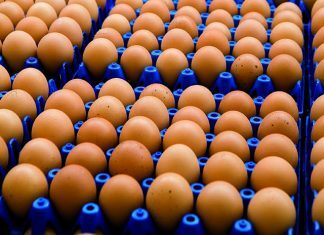 Home Poultry Facts Hatchery Practice What happens during transfer? 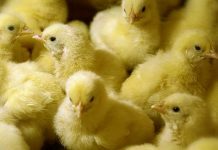 Why chicks can’t set and hatch in the same incubator and need transfer. You have to keep the transfer room at 26 °C with a minimal humidity and a low but stable airflow. The air pressure should be at 2.5 Pa, lower than the pressure in the Setter Room (3Pa) but higher than the Hatcher Rooms (2Pa), to ensure that the air flows correctly through the hatchery. Transferral of the eggs on day 18 is the perfect opportunity to remove clear eggs (infertiles & early dead). You can do this manually with a torch, by use of a candling table with manual clear egg removal or by a system that detects and removes eggs automatically. 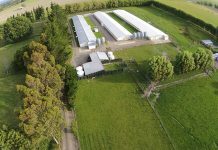 Even with an automated system, we still recommend taking samples by hand – preferably 3 sample trays per flock per week, taken from the top, the middle and the bottle of a trolley. 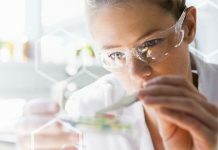 The detected clear eggs should then be broken out to see the level of infertility and the level of early dead. Don’t forget to mark the remainder of the tray for further breakouts at hatch. Eggs can be transferred by hand, putting the hatcher basket upside down over the egg tray and then turning them both together over again manually or by a specially constructed framework. However, this way of working has some disadvantages: next to the increase of cracks, manual transfer rarely involves removal of clear eggs. 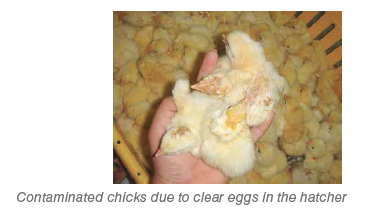 This results in many inverted eggs, causing that the egg fluid transfers to the air cell at the bottom, which leads to late mortality of the chicks. If the chicks however hatch, they will usually appear scruffy so they will be culled anyway. Although automatic systems cannot cause inverted eggs, we still recommend paying attention to ensure that they are correctly set up. 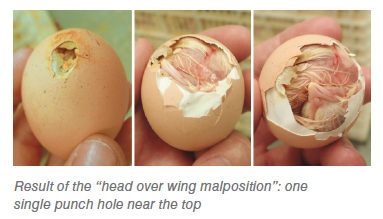 Poor alignments, eggs dropping from the transfer head and abrupt stop of hatcher baskets can cause eggs to crack. Egg-shells are particularly brittle at this stage, as the embryo has drawn and utilized much of the calcium for its development. 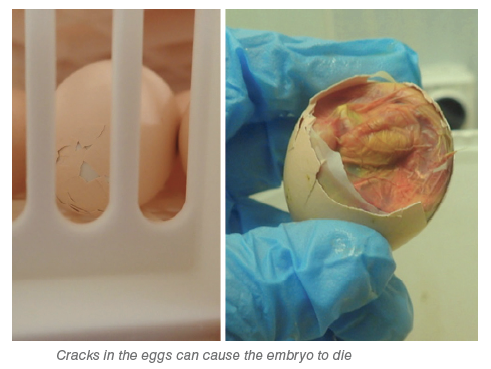 A crack at this stage will result in the embryo drying out and dying. We also recommend using transparent pipes on all suction equipment if possible. This allows seeing at a glance how clean the equipment truly is internally. 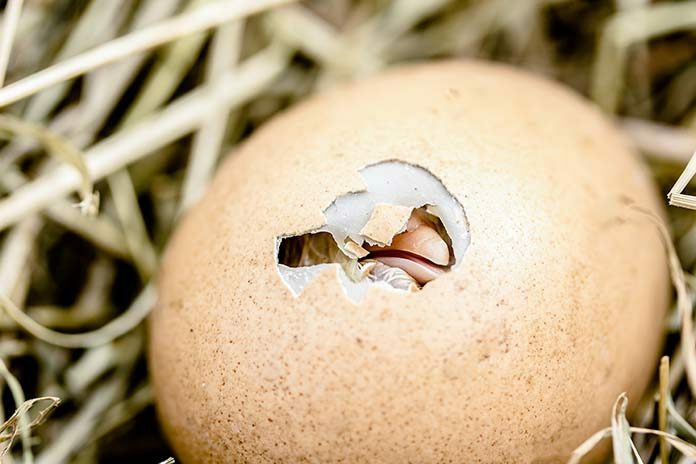 If you want to identify whether your transfer process is causing losses, break open some of the un-hatched eggs. Is the yolk sac still outside the embryo? The most likely cause of death will be transfer damage. 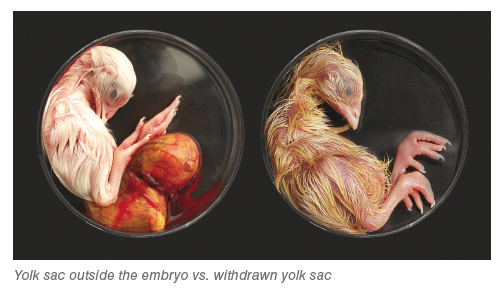 If the yolk sac has been withdrawn, this suggests the embryo survived transfer, but died in the hatcher. In this case we recommend checking the conditions of the hatcher.